Obviously, it’s the knitting and yarn stands I’m most eager to check out at Knitting & Stitching Show at Alexandra Palace, but this aspect has left me disappointed in past years. 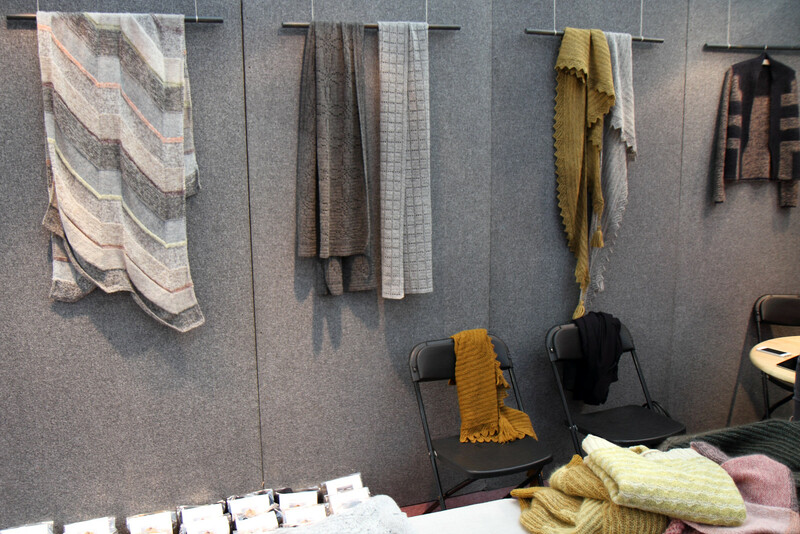 Each year I am hopeful that it will packed with independent dyers and designers, but the reality is that the cost of a stand means that these are very much the minority. 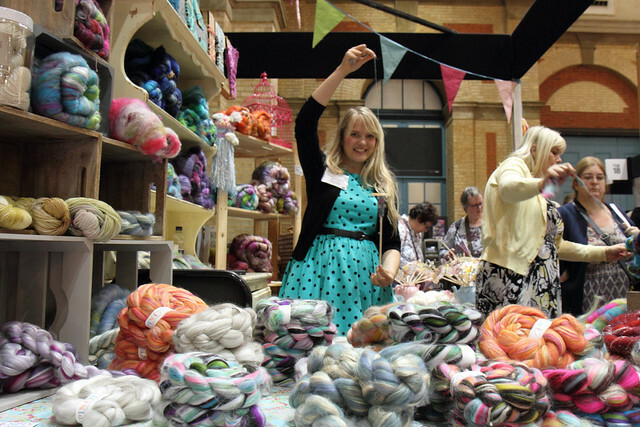 The average knitterly punter is probably fighting over bargain bails at the Black Sheep Wools stand rather than tracking down cutting edge knitwear design or artisan yarn. This is sad. This year, although that held true, there were some genuinely exciting independents that made it worth the entrance fee. 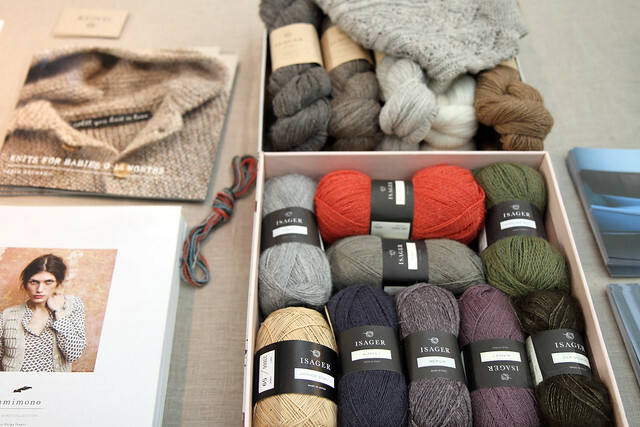 My top discovery was Isager, a yarn brand from rural Denmark. Currently causing a buzz in Europe (my German companion informed me “this is the yarn that everyone in Germany wants to knit with”), and it’s easy to see why. Their ethically produced, natural fibre yarns in timeless, earthy hues exude quality; honest to the raw materials and to traditional craftsmanship. But it’s their patterns that bring Isager bang up to date. Isager yarns are designed to be combined for multi-dimensional colour and texture, and have a unique numbering system to allow knitters to achieve tension while mixing and matching different fibres. The effect is stunning, as seen in softened lines of Toyko shawl by Marianne Isager (top left), which is available as a kit. 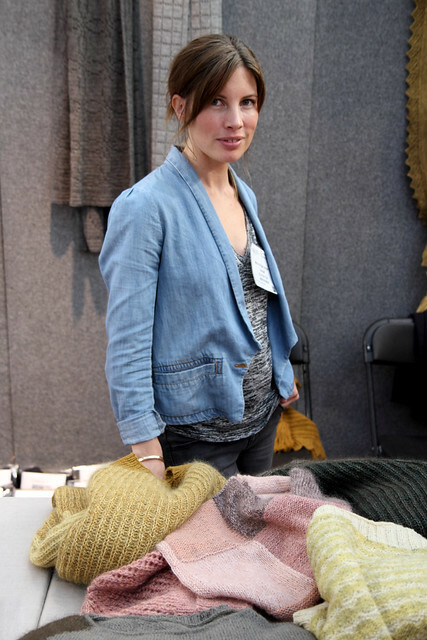 Isager’s next publication will be a collection of patterns by innovative designer, Helga Isager. As you can see, the pieces are bursting with texture depth. Her contemporary approach to the craft is perfectly captured with the book’s stylish photography, which was on display at the stand. I’ll be keeping a close eye on their website for a publish date. Pretty much the exact opposite of Isager’s restrained Scandinavian minimalism was one stall I had been itching to visit… my favourite spinning fibre emporium, Spin City. 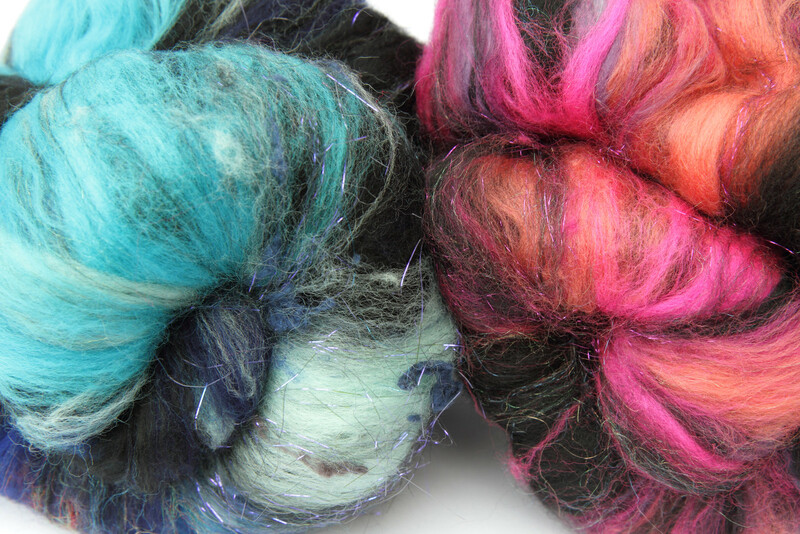 Some of my most treasured handspun projects have started life as Spin City fibre. This was the first time I’ve met owner Louise Player in person and it was an absolute pleasure. Spin City’s sweetshop-like stand was packed with soft, glittery batts and tops in bold, candy colours, all screaming to be turned into yarn. I think I showed a lot of self control to leave with just two. Louise told me she’s just opened a new online shop at spincityshop.com. It was really great to see a small producer with such an exciting and popular stand!